PhotographyTalk, one of the worlds leading photography forum and community Web sites for all levels of photographers, announces its May 2012 Giveaway, with more than $ 16,000 in digital photography prizes. Entries are accepted May 1, 2012 through May 31, 2012. One winner will receive the super grand prize of a new Nikon D800 DSLR Digital Camera (a $ 2,999.95 value) courtesy of Adorama, a leading photo, video and electronics store, located on W. 18th Street in New York City. The contest is very simple and provides everyone with added opportunities to increase their chance of winning, said Alex Schult, president of PhotographyTalk. First, ‘like’ the PhotographyTalk page by visiting http://www.Facebook.com/PhotographyTalk. Then, click on the Win a Nikon D800 & More!! page under PhotographyTalks profile. Complete the entry form. Each person that refers a friend to enter the contest will receive an additional automatic entry for the Nikon camera. Second, invite three friends and one entry is added in your name for one of 20 Bonus Prize Packages. Third, for every five friends invited to enter the contest, your name is automatically entered to win one of three grand prizes. According to Schult, the three grand prize packages, with a value of more than $ 1,200 each, include a Vanguard Auctus 323CT Tripod and BBH-200 Ball Head; an f-stop Guru Backpack with Medium ICU and a Millar Shibata Camera Bag and Lens Barrels; and a Cotton Carrier Wilderness 2 Camera Vest System. Vanguard, a global leader in high quality photo-video accessories, makes the Auctus 323CT Tripod, which supports as much as 40 lbs. (18kg) of equipment. Vanguards BBH-200 Ball Head is designed with the Rapid Level System for quick and accurate leveling with the base. The f-stop Guru Backpack is built for day photography trips and includes the medium size ICU, or Internal Camera Unit, of f-stops series of internal storage system. The f-stop prize package also includes its Shibata shoulder camera bag from the Millar Series. Cotton Carrier Camera Systems Wilderness 2 Camera Vest is the third prize in the Grand Prize Package. The vest fits all sizes and allows a photographer to carry two cameras hands free. It is manufactured from 1680 Denier Polypropylene material and a camera body rests securely in a Lexan holder. The 20 Bonus Prize Packages include 15 Topaz Labs Plug-In Bundles, Photobacks Premium Packages and Spider Holster Single Camera Systems; two PhotoshopCafe DVD bundles, with HDR & Photoshop, Photoshop CS5 and PhotoshopSecrets Photographic Effects; one Serif Bundle with PhotoPlus X5, WebPlus X5 and MoviePlus X5; one Vanguard Uprise 48 Camera Backpack; and one LowePro Pro Roller x200 Camera Bag. Topaz Labs Plug-In Bundle helps amateur and professional photographers accomplish the most common creative and corrective post-processing tasks. Photobacks Premium Package consists of 385 Photoshop templates and digital backgrounds for portraits, weddings and high-school-senior clientele. The Spider Holster System positions the photographers camera on his or her hip securely and leaves the hands free. The LowePro Pro Roller x200 Camera Bag is airline-compatible and built with the features to keep photography equipment safe and secure. Entries will be accepted for the PhotographyTalk May 2012 Giveaway from May 1, 2012 to 11:59 pm PST, May 31, 2012, at http://www.Facebook.com/PhotographyTalk. Winners will be announced on June 5, 2012. About PhotographyTalk.com PhotographyTalk promotes digital (and film) photography as a community-based social network for beginners, enthusiasts, hobbyists, serious amateurs and professional photographers who are passionate about creating their visions with the techniques and art of photography. PhotographyTalk is highly ranked among the leading photography Web sites with more than 141,000 Facebook fans and more than 226,000 Twitter followers. This entry was posted in Which Open Source Blog and tagged 2012, Camera, D800, DSLR, Features, Giveaway, Grand, Nikon, PhotographyTalk, Prize, Super on March 4, 2013 by Administrator. PhotographyTalk, one of the worlds most popular online photography communities, is now accepting entries for its May 2012 Giveaway. For simply liking PhotographyTalks Facebook page and referring friends to like it too, anyone will be eligible for more than $ 16,000 in digital photography prizes. The contest runs from May 1, 2012 through May 31, 2012. PhotographyTalks vendor partner, Adorama, is providing the super grand prize of a new Nikon D800 DSLR Digital Camera (a $ 2,999.95 value). Adorama, located in New York City, is known throughout the world for its comprehensive inventory of photo and video equipment and electronics, its customer service and competitive pricing. Our vendor partners have made the PhotographyTalk May 2012 Giveaway an amazing contest that I know every photographer will want to enter and invite his or her friends to enter too, said Alex Schult, president of PhotographyTalk. In addition to Adoramas contribution of a new Nikon D800, Vanguard, f-stop and Cotton Carrier are providing some of their finest products for the three grand prizes. Then, Topaz Labs, Photobacks, Spider Holsters, PhotoshopCafe, Vanguard and LowePro are offering combinations of prizes for our 20 Bonus Prize Packages. Schult encourages everyone to visit http://www.Facebook.com/PhotographyTalk. 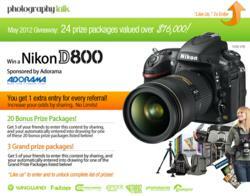 Then, click on the Win a Nikon D800 & More!! page under PhotographyTalks profile to complete the entry form. Anyone who refers a friend to enter the contest will receive an additional automatic entry for the Nikon camera. For every three friends referred, the referring party is entered for one of 20 Bonus Prize Packages. A person that convinces five friends to like PhotographyTalks Facebook page will have his or her name added to the drawing for three grand prizes. The three grand prizes consist of a Vanguard Auctus 323CT Tripod and BBH-200 Ball Head; an f-stop Guru Backpack with Medium ICU and a Millar Shibata Camera Bag and Lens Barrels; and a Cotton Carrier Wilderness 2 Camera Vest System. Each is valued at more than $ 1,200. About PhotographyTalk.com PhotographyTalk promotes digital (and film) photography as a community-based activity for beginners, enthusiasts, hobbyists, serious amateurs and professional photographers who are passionate about creating their visions with the techniques and art of photography. PhotographyTalk is highly ranked among the leading photography forum Web sites with more than 146,000 Facebook fans and more than 226,000 Twitter followers. This entry was posted in Which Open Source Blog and tagged $16000, 2012, Award, Giveaway, More, Multiple, PhotographyTalk, Prizes, Than, Winners on March 4, 2013 by Administrator. This entry was posted in Which Open Source Blog and tagged 2012, Cable, Play, Show, Showcase, Systems, Triple on February 28, 2013 by Administrator. IRS Form 1099-S is filed to report the sale or exchange of real estate. You are required to report a transaction that consists in whole or in part of the sale or exchange for money, indebtedness, property, or services of any present or forfeiture ownership interest in real estate. If a Unique Settlement Statement, prescribed under the Real Estate Settlement Procedures Act of 1974 (RESPA), is used, the settlement agent must file Form 1099-S. 1099-S software at the site 1099fire.com makes it possible to prepare Copy B for the following tax year for transferors who are selling their home now. Form 1099-S includes such information as the date of closing, gross proceeds, address or legal description (including city, state and zip code), whether the transferor received or will receive property or services as part of the consideration, and the buyers part of real estate tax. 1099-S can be filed by paper or electronically to the IRS. Our 1099-S software makes it easy to import from Excel, print and electronically filing IRS Form 1099-S quickly and easily, said Erich J. Ruth, Technical Support for 1099FIRE, a market-leading provider of 1099-S software and services. Sample Excel templates can be found on the website 1099fire.com which will import into the 1099FIRE software or technical support can guide you through the process of importing by phone or email. Electronic reporting of information returns eliminates the need to submit paper documents to the IRS. Electronically filed information may be submitted to the IRS 24 hours a day, 7 days a week. Electronic filing of Form 1099-S is easy to do, said Ruth and The system is updated each year to reflect the format changes that are made by the IRS. 1099FIRE software creates original, replacement, corrected and test files in the format required by the IRS for electronic transmission. Filing information returns can be stressful. 1099FIRE can eliminate the stress of filing information returns by electronically filing in a timely manner and at an affordable price. 1099FIRE will beat any competitor price; attain a quote for any service from any competitor and 1099FIRE will provide same, if not more complete, service at a lower price. 1099FIRE is dedicated to providing feature-rich 1042-S, 1097-BTC, 1098, 1099, 3921, 3922, 5498, 8027, 8955-SSA, W-2G and W-2 software. Import, print and eFile 1099 forms the quick and easy way! 1099FIRE is a market-leading provider of information-reporting solutions and services for 1099, W-2 and 1042-S filers. 1099FIRE develops and markets a comprehensive range of products that enables any size business or institution to effectively comply with all 1099, W-2 and 1042-S filing requirements. Have 1099FIRE Service Bureau handle all of your printing/mailing and IRS filing needs – it’s secure, affordable and stress free! This entry was posted in Which Open Source Blog and tagged 1099FIRE.com, 1099S, 2012, Announces, Form, season, Software on February 25, 2013 by Administrator. The Phoenix Fashion Awards, to be held on December 19, 2012 at Park Hyatt Hotel in Beijing, China, will honor preeminent Chinese fashion leaders and fashion brands and celebrate their accomplishments. As a media partner of the Phoenix Fashion Awards, YUE will cover the entire red carpet event and dinner party, with special emphasis on the award presenters and winners from New York City. Chiu-Ti Jansen, Publisher of YUE Magazine and a Board Member of the Couture Council of Museum at the Fashion Institute of Technology, will also be presenting an award during the gala. The launch of the Phoenix Fashion Awards attests to the contemporary Chinese society’s ever-growing interest in fashion and style, said Ms. Jansen, Conversely, the international world of fashion also looks to China as the next frontier of style and taste-making. I am delighted to be part of this cross-fertilization of ideas, talents and imagination. Expected to bring together 1,000 participants across the fashion, design, entertainment and media industries from China and worldwide, the 2012 Phoenix Fashion Awards will culminate in a grand ceremony featuring the theme of Chinese Articulation, Fashion Outlook. Award recipients are the pioneers in the fields of design, jewelry, cosmetics, media, modeling, entertainment, photography and fashion entrepreneurship, who have a great impact on the fashion world in China and who bring Chinese articulation to the international fashion stage. Among the many notables expected at the Award Gala are: Liu Wen (ranked No. 5 on Models World 2012 Top 50 Models List), Wendi Deng Murdoch (producer of Snow Flower and the Secret Fan), Lang Lang (international concert pianist), Liu Jiang (Chairman and founder of the Trends Media Group), Zhang Xin (Co-Chairman of SOHO China), Chen Shiying (jewelry designer), Lan Zhenzhen (Vice Chair of LOreal China), Hong Huang (TV host and publisher of fashion magazine iLook), Chen Man (fashion photographer), Cecilia Cheung (singer and actress), Chris Lee (pop singer), Lei Jun (Chairman of Kingsoft Software Company), Zhang Xiaolong (Vice president of Tencent Holdings Limited), Mona Lee Locke (Spouse of Ambassador Gary Faye Locke, American Ambassador to China and former Washington State Governor), Ye Mingzi (fashion designer), Zhang Zilin (former Ms. China and actress) and Du Chun (actor). For more information about the 2012 Phoenix Fashion Awards, please visit http://fashion.ifeng.com and contact 212.407.9302. YUE, a preeminent Chinese-English lifestyle magazine, is published by a joint venture established by Observer Media Group and CHINA HAPPENINGS. YUE is modern luxury Chinese travelers gateway to the high-end, history-rich brands across fine jewelry, watch, fashion, art, culture, design, real estate and lifestyle industries in New York City. Since its launch in November 2011, YUE has gained a following among Chinese business and leisure travelers and New York luxury businesses as the embodiment of New Yorks international lifestyle. Phoenix Television is one of the top broadcasters and television networks in Greater China. Headquartered in Hong Kong and privately owned, the Mandarin Chinese television network serves Mainland China and Hong Kong, along with other markets with substantial Chinese viewers. Through six different television channels, including Phoenix InfoNews Channel, Phoenix Chinese Channel, Phoenix Movies Channel, Phoenix Hong Kong Channel, Phoenix Television provides news, information and programs covering current affairs, fashion, entertainment and sports, among others. Phoenix TVs affiliated fashion-focused website– http://fashion.ifeng.com –is a leading online fashion platform in Greater China, bringing to its viewers timely reports on global fashion news, trends and happenings. CHINA HAPPENINGS is a multimedia platform founded by Chiu-Ti Jansen, Publisher of YUE Magazine, to focus on the lifestyle and cultural industries of contemporary China. Ms. Jansen wrote a column titled CHINA HAPPENINGS for the NYO Magazine. She has also written on Chinese luxury lifestyle and cultural scenes for English publications such as Sothebys at Auction magazine and the Whitewall Magazine. A native speaker and writer of Mandarin Chinese, she regularly contributed to the China Times, the United Daily and The Artist Magazine on a wide array of cultural and art-related issues. Prior to founding CHINA HAPPENINGS, Ms. Jansen was a New York-based corporate partner of Sidley Austin LLP, an international law firm of approximately 1,700 lawyers. Educated at National Taiwan University with advanced degrees from Yale and Columbia, Ms. Jansen is currently an International Honorary Ambassador of the Lang Lang International Music Foundation, a member of the Contemporary Art Advisory Committee of China Institute in America, a Board Member of the Couture Council of Museum at the Fashion Institute of Technology (FIT) and a life member of the Elizabethan Club (for Renaissance Studies) of Yale University. The Art and Living magazine recently featured her in an interview included in its 2012 Bridging the East and the West Edition She has appeared as a fashion expert on Chinas top-rated fashion/beauty show I Am a Great Beauty and has been interviewed by Wall Street Journal, Womens Wear Daily, World Journal, Jing Daily, SINOVISION, China Press, Sing Tao Daily, among others. Ms. Jansen has hosted featured video presentations on the New York Fashion Week for Chinas SINA FASHION, interviewing designers and super models such as Jason Wu, Liu Wen, Phillip Lim and Oscar de la Renta. This entry was posted in Which Open Source Blog and tagged 2012, Awards, Fashion, Media, Partners, Phoenix, Present on February 22, 2013 by Administrator. IntelliSoft Group LLC, a leading developer of medical credentialing and Application Management software, announces the release of version 12 of their industry leading credentialing and provider enrollment software. IntelliSoft has added functionality to the WebView module of the IntelliCred and IntelliApp systems making the submission of online applications for practitioners easier and quicker. Practitioners can now fill out the application, upload all required documents and even request privileges and submit this online via WebViews secure portal. In addition, a new Electronic Meeting functionality has been added to WebView to enable online Credentialing Committee meetings. IntelliSoft has also enhanced the privileging portion of IntelliCred, providing a number of template forms to choose from, exclusive contract language, and valuable content to help users as they create their own facilities privileges. There are also enhanced search capabilities within the privileging module. Finally IntelliSoft Group has added Patent Pending functionality, called iPoptm to map system data, including all practitioner data, directly to web forms found on payer websites such as PECOS for Medicare submissions and CAQH. Any web form can be mapped eliminating tedious and time consuming manual data entry that is required by health professionals currently. As the information is already in the database, it makes sense to be able to migrate it to the Webpage using iPoptm without retyping, cutting or pasting. Says Mike Aha, Director of Development. 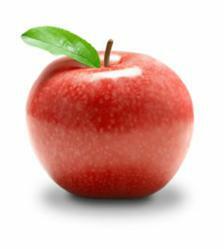 iPop” improves accuracy and security as well as saving time. With both IntelliCred and IntelliApp, users now have the ability to automate and streamline many of the processes that have traditionally been bogged down in paper. This is one of our most aggressive launches from a development and feature set perspective, says Michael J. Melville, president of IntelliSoft. He continues, At IntelliSoft Group we are not happy with just keeping up with the competition, we want them trying to keep up with us. I think the features found in our latest version will give software vendors in the medical credentialing and payer enrollment industry something to try and emulate the bar has been raised. Intellisoft Group is committed to delivering a solid, bug-free and enhancement rich product. says David Aucoin, Executive Product Evangelist and Director of Quality Assurance. We’ve taken great pains to go through a vigorous testing process prior to this release. Based in Nashua, New Hampshire, IntelliSoft Group is the leading producer of medical credentialing and provider enrollment software products. The companys products, IntelliCred, IntelliApp, and IntelliContract are used by hundreds of healthcare systems, hospitals, managed care organizations, credentialing verification organizations, individual practice associations, and primary health organizations throughout the U.S. and Puerto Rico. IntelliSoft Group can be found online at http://www.intellisoftgroup.com. This entry was posted in Which Open Source Blog and tagged 2012, Announces, Group, IntelliSoft, Release, Software, Version on February 19, 2013 by Administrator.